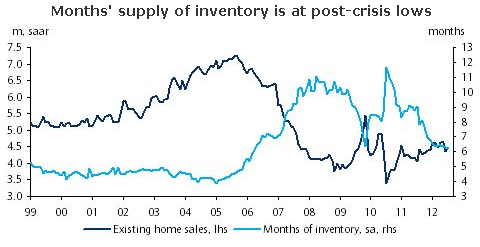 As discussed earlier the US housing recovery is progressing, albeit quite gradually, as the unsold inventory of homes continues to decline. Barclays Capital: - We continue to see conditions in the existing home market as putting downward pressure on inventories and as supportive of a gradual cleansing of shadow inventory. Our view is that housing is in a recovery phase, but one that will be restrained by the availability of credit, pace of improvement in labor market conditions, and overhang from distressed and foreclosed properties.